When I was given the opportunity to review Yor, the Hunter From the Future, I knew going into it that it would mainly be a cheesy B-movie to riff on. I had seen Red Letter Media’s Best of the Worst episode featuring the movie and knew it was considered to be one of the worst films ever made. After watching the film, I will fully admit that the movie is bad. However, I actually think Yor, the Hunter From the Future is somewhat better than the reputation it has. I wouldn’t watch it again other than to riff on it, but I don’t think I would call it one of the worst movies of all-time. Even though I think the film is just bad, not horrible it is still ripe with riffing material including at least three laugh-out-loud moments and a bunch of goofy scenes to poke fun at. Yor, the Hunter From the Future is based on the Argentinian comic book Yor and stars B-movie veteran Reb Brown (who is also known as Captain America in the awful 1979 TV film adaptation) as the title character. Yor is a mighty warrior on the quest to figure out his true identity. Along the way, he takes on dinosaurs, evil cavemen, and more with the help of Kala (Corinne Cléry) and Pag (Luciano Pigozzi), two villagers he saved earlier. I can’t go into much more detail without spoiling the sci-fi twist the story has towards the end. I’ll start the review portion of this post with an overview of the quality of the film, something I’m sure most of you could care less about for a B-movie like this. I would say that Yor, the Hunter From the Future is nowhere near as bad as a lot of people claim. The actors try their best (even though they don’t have much talent), the action scenes aren’t all that bad, and love and care were put into the dinosaurs and other elements of the film. Also, the film is quite short with just an 88-minute run time, keeping it from becoming too boring. The biggest problem quality-wise is just that the story is pretty bad, doesn’t really go anywhere, and the twist doesn’t make a lot of sense if you really think about it. I personally wouldn’t call Yor, the Hunter From the Future a bad film, just a dull one that is better used as riffing material. However, I know most of the people reading this review only really care about the cheesy B-movie elements of Yor, the Hunter From the Future. Most potential viewers certainly aren’t looking at it for a rich plot or great acting, they want to know how funny the movie is to laugh at and/or riff on. In terms of riffing material, I would say Yor is above average but nowhere near B-movie classics like Plan 9 From Outer Space (mainly because it’s actually a semi-competently made film). Highlights of the film include Yor flying through the air on a bat-like creature he just killed, the amazing acrobatics of Pag, and of course that “damn talking box!! !” There are also plenty of laughs to go around in the fight scenes, the theme song is gloriously terrible, and the movie spends the final act trying (and failing) to ripoff Star Wars. All in all, while there aren’t a ton of extremely hilarious scenes, there are still plenty of things to laugh at throughout the film. Unsurprisingly, this is the first time Yor, the Hunter From the Future has been released on Blu-ray. Usually films like this don’t even get Blu-ray releases but this one is a bit of a cult favorite so Mill Creek Entertainment decided to give it a visual update. Overall, I would say the video quality on the Blu-ray is solid but unspectacular. The film does look a bit grainy at times, but I would guess this is about as good as a 35-year-old low budget film can look on Blu-ray. While this is the first time I have seen the film (so I can’t compare it to the DVD releases), I would guess that it is worth the upgrade if you are a fan of this cult film. Unfortunately the bonus features are a little sparse for an anniversary edition Blu-ray release. 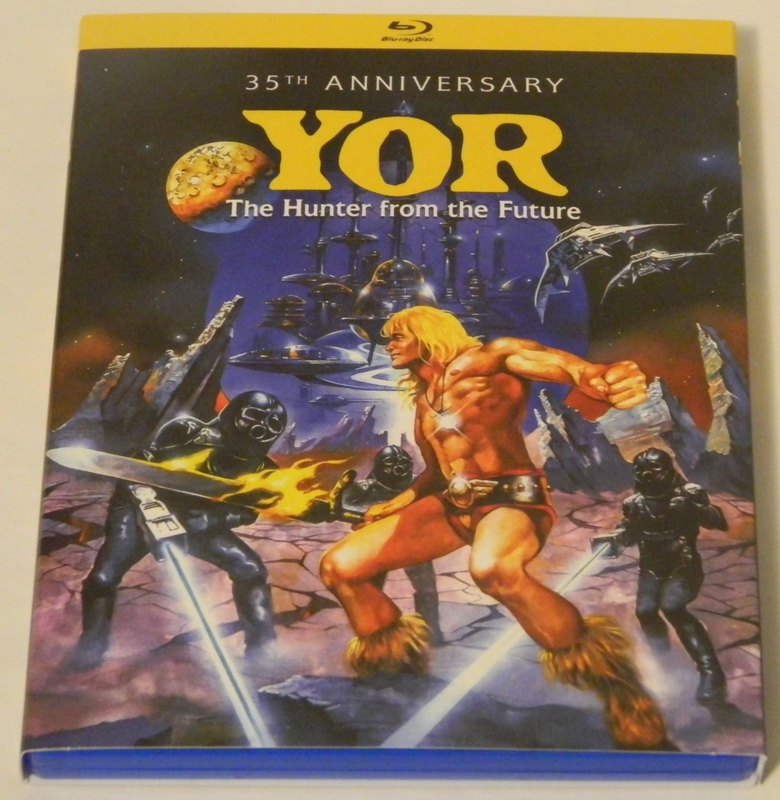 Yor, the Hunter From the Future: 35th Anniversary Edition only comes with a new audio commentary from star Reb Brown and the theatrical trailer for the film. I’m not a big fan of commentaries so I didn’t give it a try and thus can’t make a recommendation on whether or not it is worth a listen. The theatrical trailer is basically what you would think, a nice addition but not something most people are going to care about. In conclusion, Yor, the Hunter From the Future is definitely a bad movie. However, I don’t think it warrants its moniker of being one of the worst movies ever made. It is certainly cheesy and the story doesn’t really go anywhere, but there was definitely some love and care put into this film. Even though I didn’t think the film was as bad as it’s made out to be, I still found plenty of cheesy moments to laugh at and I think it is above average material for riffing. The movie itself would get a 2.5/5 from me but I grade B-movies based on how funny they are to riff on. Since Yor, The Hunter From the Future provides some good laughs, it gets a 3.5/5 as a B-movie and is recommended for fans of the genre. Yor, the Hunter From the Future releases on Blu-ray for the first time on January 16, 2018. We would like to thank Mill Creek Entertainment for the review copy of Yor, the Hunter From the Future used for this review. Other than receiving the review copy we at Geeky Hobbies received no other compensation. Receiving the review copy had no impact on the content of this review or the final score. A fun, cheesy B-movie with some laugh-out-loud moments. Even though it is definitely a B-movie, I didn't think the movie was nearly as bad quality-wise as it is made out to be. Blu-ray video quality is probably about as good as a 35-year-old low-budget film can look. The story doesn't really make much sense or go anywhere. As with all B-movies, the only real reason to watch this film is to riff on it.